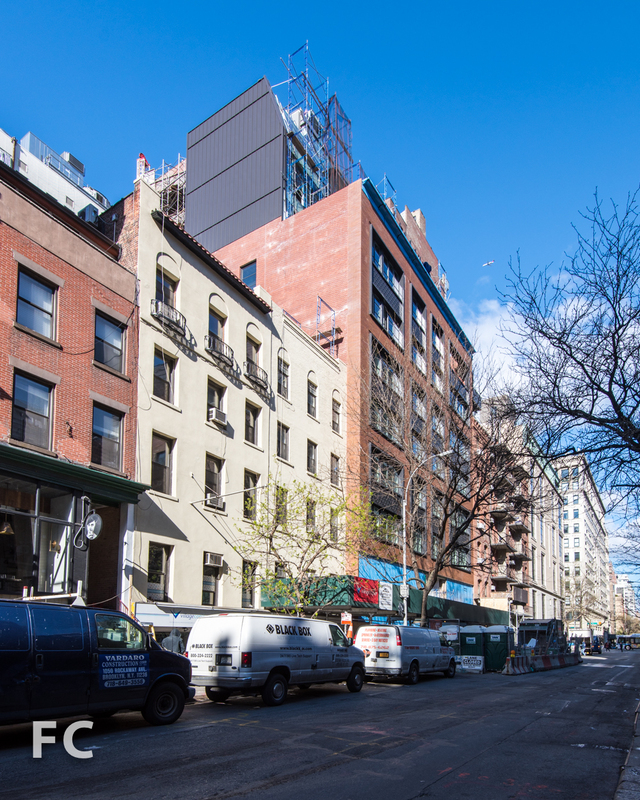 Construction scaffolding has started to come down at DHA Capital and Continental Properties' 12 East 13th Street in Greenwich Village, revealing its brick and glass facade. The former 8-story parking garage has been converted by CetraRuddy into eight residences, replacing the facade and adding a 4-story metal and glass penthouse. A burnished orange-red Roman brick clads the 8-story primary street facade, punctuated by four bays of industrial-style windows grouped into vertical columns of two. The black metal spandrel that divides the windows contains a chevron motif inspired by a pattern from the original facade. With additional details like a depressed border of brick surrounding each window bay, the facade of the base building blends nicely with the brick and metal structures which surround it. Northeast corner from East 13th Street. North facade from East 13th Street. Northwest corner from East 13th Street. 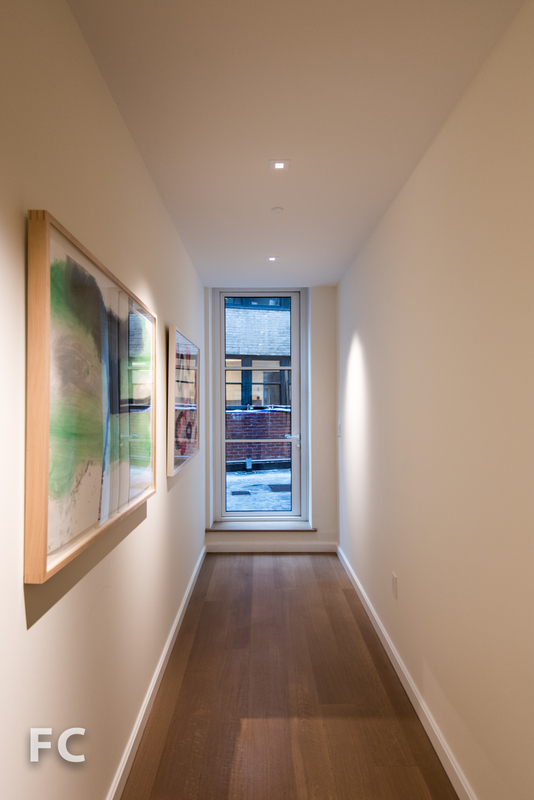 Inside, most lower units occupy the full 4,816 square-foot floor plate while the upper floors feature a duplex and a triplex in the added penthouse structure. 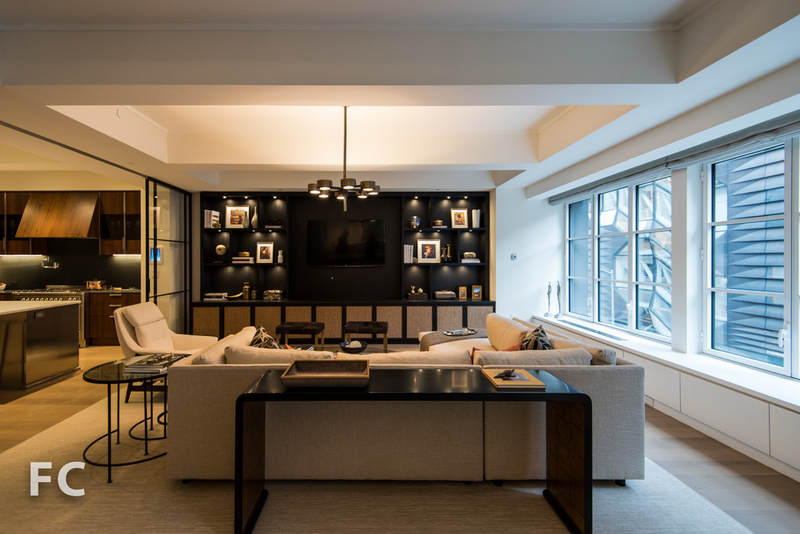 An open plan along the 67-foot street front accommodates living and dining spaces in one large great room. Industrial style black metal and glass sliding doors act as moveable partitions, allowing residents to close off the family room next to the kitchen. Existing steel columns have been preserved and featured in the living and dining area, complimenting the interior design's blending of modern and industrial. Much of the interior kitchen and bath cabinetry and door hardware have been custom designed by the architect and also reflect this aesthetic. Move-able partitions and existing columns. Bedrooms and accompanying bathrooms are located along the back half of the floor plate. Most units contain four bedrooms and bathrooms, as well as a powder room off the living space. Secondary bathroom with custom white lacquer vanity including water resistant galvanized drawer fronts. Detail of the water resistant galvanized drawer fronts. Master bathroom vanity featuring rift-cut white oak cabinetry and a countertop of polished Calacatta Borghini marble. Freestanding 6 foot soaking tub. Custom door hardware in the master bathroom. Half of the units will contain outdoor space, including an 807-square foot terrace on the third floor, a 1,760-square foot terrace on the ninth floor for the duplex, and space on the tenth floor for the triplex. Amenities for the building include the much touted automated parking system that allows residents to enter the building in privacy while their car is parked robotically on the second floor garage. 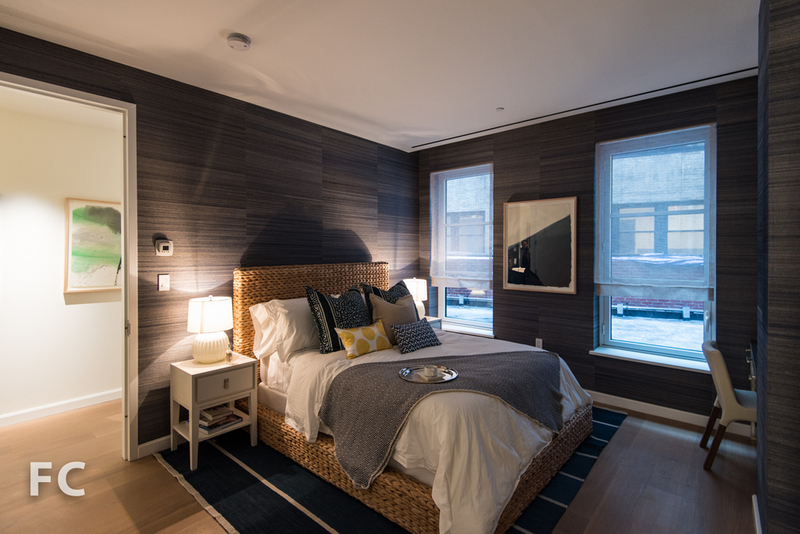 Additional amenities include gym, bike storage, and private storage unit. 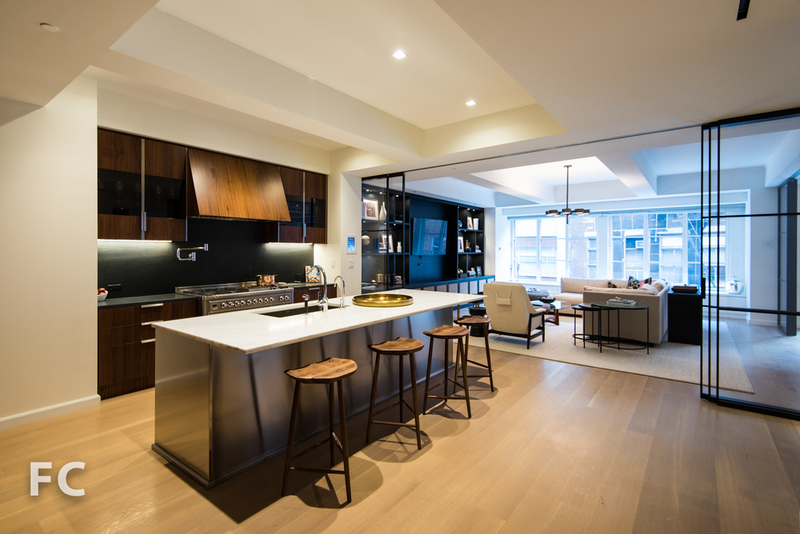 Architects: CetraRuddy; Developers: DHA Capital and Continental Properties; Public Relations: M18; Program: Residential, Retail; Location: West Village, New York, NY; Completion: 2015.